Students will go online and do a research on“ Querida Abby” Dear Abby. Students will choose 2 letters. 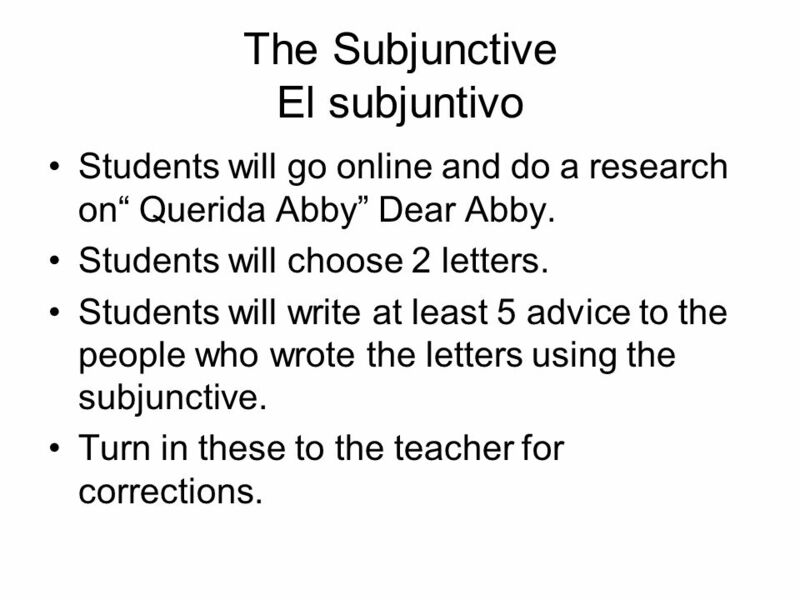 Students will write at least 5 advice to the people who wrote the letters using the subjunctive. Turn in these to the teacher for corrections. 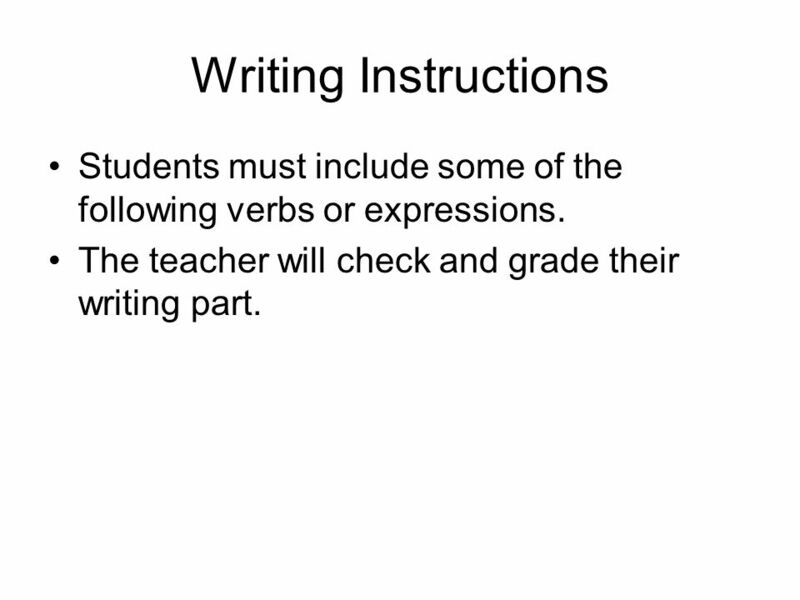 2 Writing Instructions Students must include some of the following verbs or expressions. The teacher will check and grade their writing part. 6 Avatar Students will go to voki.com and create an Avatar. 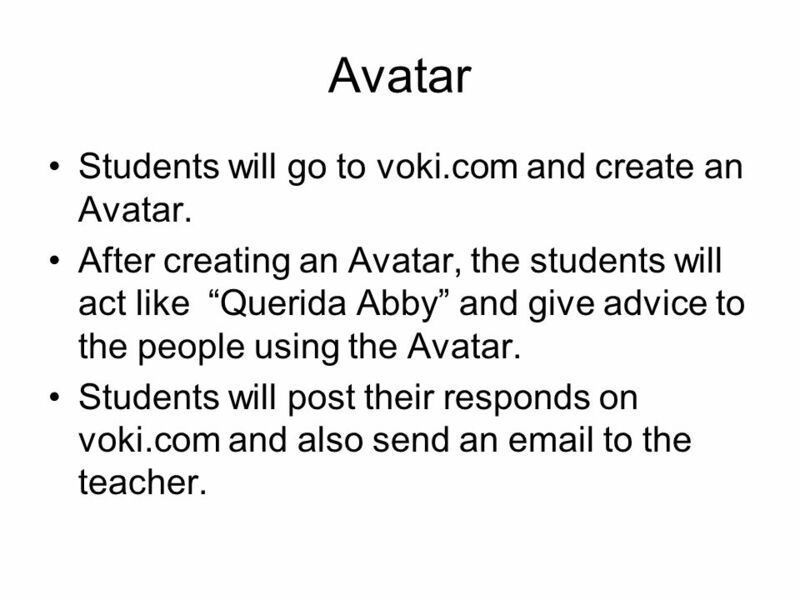 After creating an Avatar, the students will act like “Querida Abby” and give advice to the people using the Avatar. Students will post their responds on voki.com and also send an to the teacher. 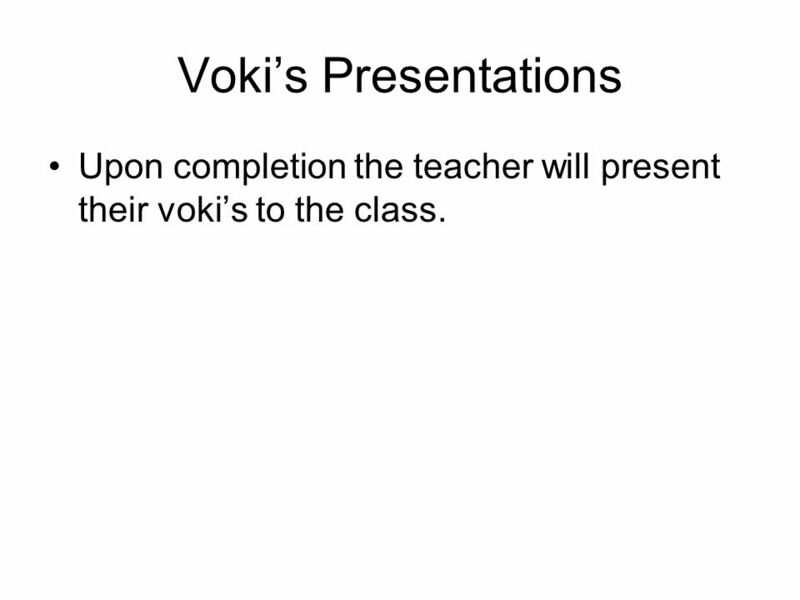 7 Voki’s Presentations Upon completion the teacher will present their voki’s to the class. 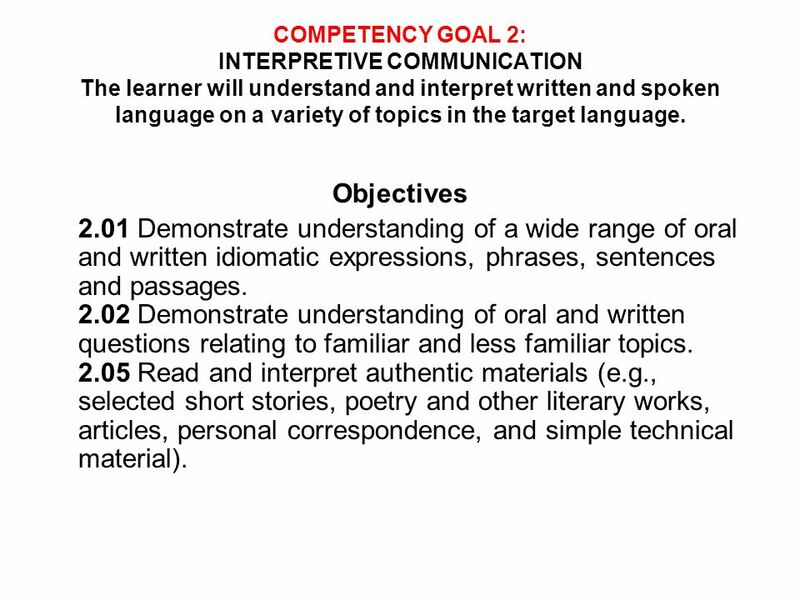 10 COMPETENCY GOAL 2: INTERPRETIVE COMMUNICATION The learner will understand and interpret written and spoken language on a variety of topics in the target language. Objectives 2.01 Demonstrate understanding of a wide range of oral and written idiomatic expressions, phrases, sentences and passages Demonstrate understanding of oral and written questions relating to familiar and less familiar topics Read and interpret authentic materials (e.g., selected short stories, poetry and other literary works, articles, personal correspondence, and simple technical material). 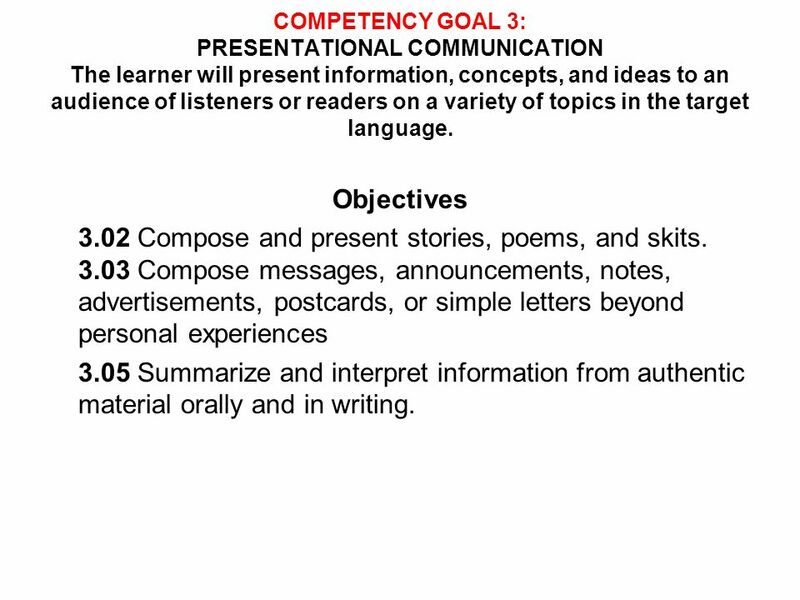 11 COMPETENCY GOAL 3: PRESENTATIONAL COMMUNICATION The learner will present information, concepts, and ideas to an audience of listeners or readers on a variety of topics in the target language. 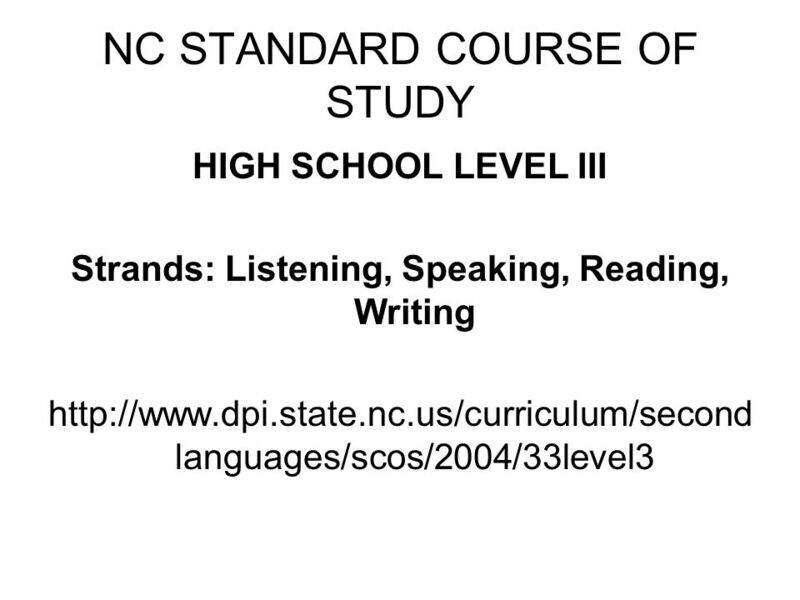 Objectives 3.02 Compose and present stories, poems, and skits Compose messages, announcements, notes, advertisements, postcards, or simple letters beyond personal experiences 3.05 Summarize and interpret information from authentic material orally and in writing. 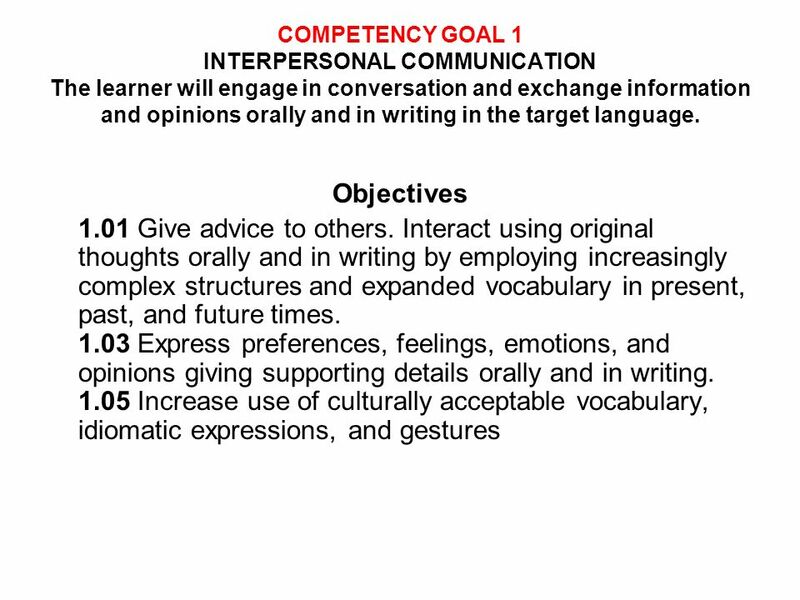 12 COMPETENCY GOAL 6: CONNECTIONS The learner will acquire, reinforce, and further his/her knowledge of other disciplines through the foreign language 6.01 Acquire and process information from a variety of sources in the target language about a topic which is common to other disciplines. 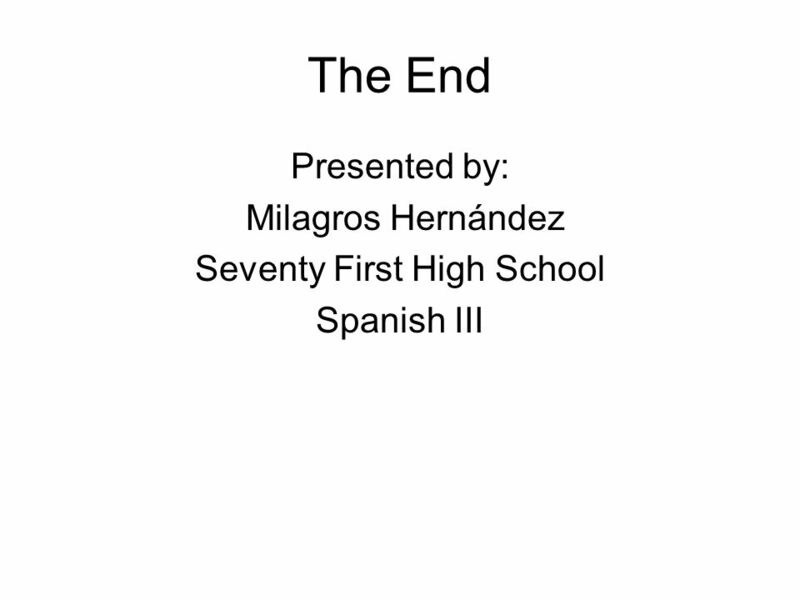 Download ppt "The Subjunctive El subjuntivo"
Español I WL 21. Course Outline Spanish I: Introduces students to the basic vocabulary of the language and components of the culture of the countries. WORLD LANGUAGES ELEMENTARY OCISS Annex, Room 226 May 12, 2006. Personal and Public Identities Can we guide students through a self exploration using this theme? FLTWM Collaborative – Elms College March 7, 2013 Adina. 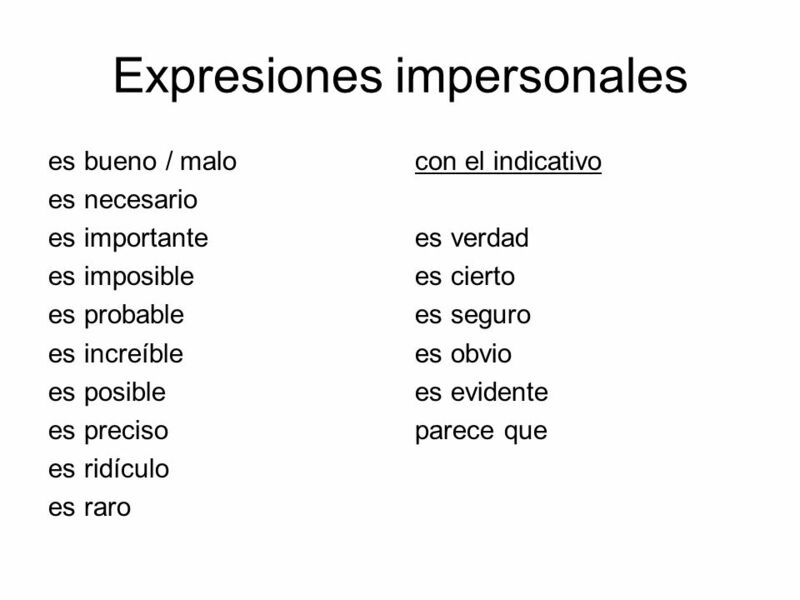 El Subjuntivo When to use it – Indicators #2 So Far  You have learned so far to use the subjunctive with the following: To express necessity and possibility. 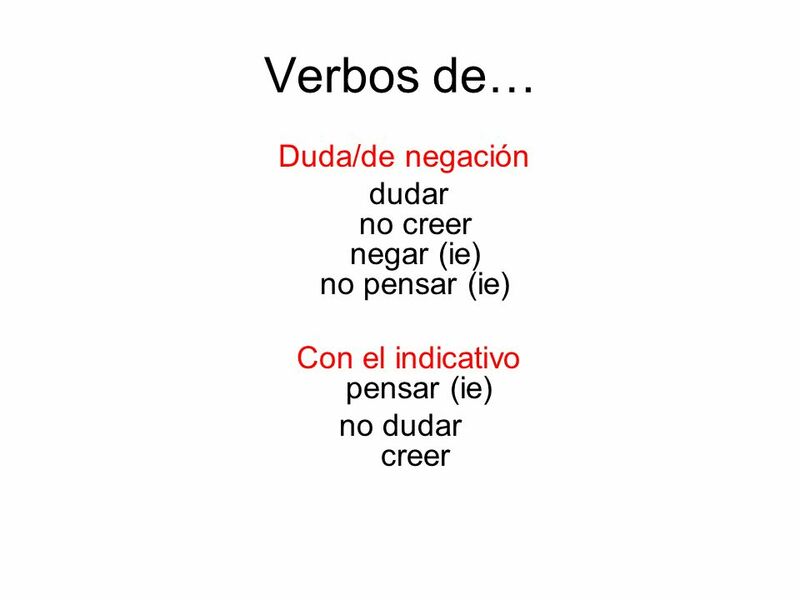  How to form the present subjunctive  Yo form –o, + opposite ending  Stem-changing –ar, -er verbs  stem-changing in all forms except the nosotros. Word of the day (Palabra del día) : 1 - Copy the palabra del día (PDD) in the “Word of the Day” section of your notebook under Semana 20 – 12/16 – 12/20. Word of the day (Palabra del día) : 1 - Copy the palabra del día (PDD) in the “Word of the Day” section of your notebook under Semana 27 – 2/3 – 2/7. 1. This is fancy grammar talk for a sentence with at least 2 clauses ; The verb in the first (or main) clause determines whether or not the verb in the second. 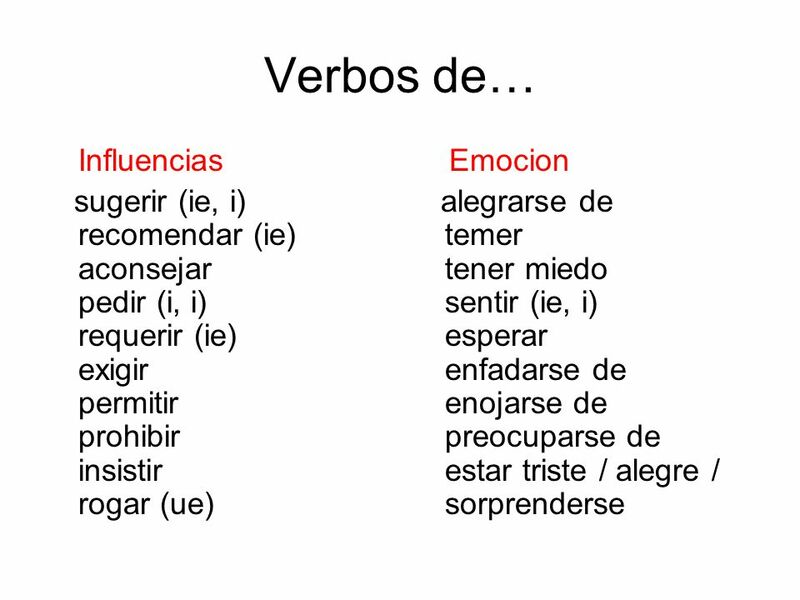 The Subjunctive With Impersonal Expressions (El subjuntivo con expresiones impersonales) Es importante que estudies para ser médico. THE SUBJUNCTIVE MOOD  You already know many tenses in the indicative mood.  This mood is used to talk about facts or real events. W.E.I.R.D.O verbs. W = Wishing and Wanting Desear – to wish Querer – to want. Rules on how to use verbs in the subjunctive are on the handout. Irregulars: DISHES Stem-changers.